Golf carts are fun, but they just look so puny. 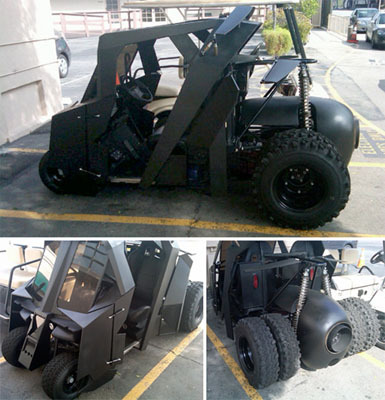 Instead of riding around in some incredibly slow and fragile looking golf cart, you need this Batman inspired golf cart. Sure, it’s not going to be able to do nearly as many tricks as the tumbler in the Batman movies, but at least you’ll get to look cool while cruising around at the high speed of 15 miles an hour. This just happens to have been created by a Warner Bros. employee who works in LA. Hopefully his creation will soon be a part of the tour of the studio, at least it should be added. There is no current tutorial or any hint on how this was made. This is just a picture that someone captured while on the studio grounds, so there really isn’t much information at all to go with it. The cart is built by Marcs Creature Company.